You Have Beautiful Eyes (2005) © Banksy. Image Source: California Literary Review. There are a number of sources online that confirm that since roughly 13 April the radiation from Japan's Fukushima reactors is reaching mid-levels in North America, with low levels reaching Europe. For a report on cesium-137 found in Vermont milk a week ago today - as well as radiation levels in water and milk across the US, go here. Some experts believe that next week there will be more solid information in the United States. There is a general Japanese Ministry NISA fact page here and the French institute IRSN has a main page on this issue here. The German institute GRS has a fact sheet here. A list of radiation-monitoring Webpages is here, including several links to Asian monitoring sites. Chalk River Labs. Image Source: National Research Council via Capital News Online. Chalk River Labs, Ontario. Tucked away on the Ottawa River, near the small town of the same name in the Laurentian Hills (a range that becomes the Adirondacks as you cross the US border), this nuclear research facility sits 180 kilometres (110 miles) north-west of the country's capital. Established in 1944, the lab was one of the places where CANDU reactor technology was developed. The site fostered the work of two Nobel prize winners (Brockhouse and Cockcroft). It has long supplied most of the world's medical isotopes. It is also the location of the worst nuclear leaks in Canadian history. The largest of these ran at level 5, on par with the Three Mile Island incident in Pennsylvania. Like many of these places, the name of the lab stirs a brooding uneasiness in the local psyche. The lab sits in the Western Quebec Seismic Zone, where the largest recorded earthquake was likely an 8 on the Mercalli scale (roughly 7 or larger on the Richter scale). We come then to the possibility of a major accident at a nuclear plant. Keep in mind that the nuclear fission promoters plan in the next 30 years 100 new nuclear power plants in Canada — all the size of the one at Pickering. The Atomic Energy Commission in the United States plants to license about 1,000 large nuclear power plants in the next 30 years, a plan that would produce the radioactive equivalent of one million Hiroshima bombs every year — plus 600,000 lbs of plutonium 239 annually. Just one pound of plutonium — which has a half life of 24,360 years —escaping into the environment and inhaled eventually by human beings, could cause several billion cases of lung cancer. Is it any wonder that many atomic scientists are appalled by the consequences of unsuccessful containment of radioactivity? Dr. Hannes Alfven, the 1970 Nobel laureate for physics, says: "In a full-scale fission programme, the radioactive waste will soon become so enormous that a total poisoning of our planet is possible". That is in the bulletin of the Atomic Scientist of September, 1971. Soon afterwards, in the December, 1971, issue of Nuclear News, the director of the AEC's Oak Ridge national laboratory, Dr. Alvin Weinberg, said: "Technical deficiencies in a plutonium economy, if unremediable, could mean catastrophe for the human race." In Science, Feb. 25, 1972, the former director of the AEC's Argonne National Laboratory, Dr. Albert Crewe, after discussion of the medical foresight, the engineering skill and the administrative controls required by nuclear technology, summarized as follows: "Should any of these three lines of defence fail, then the entire population of the world would be in serious danger." Mr. Speaker, we spank little children for plaving with matches. What should we do to those human beings who are foisting upon us the unthinkable hazards of nuclear power? Let us return to the consideration of the possibilities of a major accident at a nuclear plant as described by Gordon Edwards, a mathematician at the University of British Columbia, to whom I am indebted for this and some other sections of my remarks. He says: A single, relatively small, 100 megawatt reactor, after one year of operation contains more radioactive cesium, strontium and iodine than all the nuclear weapon tests ever conducted. In his famous Brookhaven report of 1957, he says: The AEC indicated what the results of a single major accident at a relatively small reactor 40 miles from a city might be: 3,000 to 4,000 deaths immediately from radiation poisoning; 50,000 deaths later on from radiation-induced injuries; up to 150 square miles of land contaminated— not to mention contamination of water supplies and evacuation of half a million people. The Brookhaven report goes on to say that the probability of such an accident occurring is so low as to be almost inconceivable. This is a most unscientific statement, as the probability of most accidents is so low as to be almost zero. Gordon Edwards asked: How do you compute the probability of an accident? Do you include or do you exclude the possibility of sabotage? Do you include the possibility of war? Do you exclude the possibility of an undeclared war? What would happen if an old-fashioned conventional bomb were dropped on a reactor? Do you include the possibility of an airplane crashing into a reactor? Remember, Pickering is going to be the site of a huge airport as well as the site of the huge reactor. As recently as November, 1972, we witnessed the spectacle of a band of hijackers threatening to crash a plane into a nuclear installation at Oak Ridge. As a matter of fact, Mr. Speaker, the nuclear installation was evacuated but the hijackers changed their minds for which we should all be very thankful. But it could happen accidentally, too. All this does not begin to consider the very real possibility of a large industrial accident occurring within the plant as a result of mechanical and/or human failure. Accidents have occurred at Chalk River, resulting in the release of 10,000 curies of fission products; at the Enrico Fermi plant between Toledo and Detroit leading to a partial meltdown of the core and fears of explosion; and at the Windscale plant in Great Britain which spewed out vast quantities of radioactive debris; and at others. In 1970 there was a close call at the huge Hanford reactor and a failure at the Oak Ridge research reactor. The latter involved an almost imbelievable combination of three separate human errors, two installation errors and three design errors. According to my mathematics, Mr. Speaker, that is really eight human errors. There is another danger after the fuel has served its purpose — the very serious problem of waste disposal. Where this involves transportation to a disposal site, we have the eventual, inevitable railway or highway accident to face. Another problem is that plutonium, the essential ingredient for making atom bombs inexpensively, will almost certainly become a black market item. When one thinks of the possibilities for terrorists and demented persons, this one reason alone should force the abandonment of the entire nuclear programme involving plutonium 239. On Oct. 10, 1972, Sen. Mike Gravel, who is leading the call for a nuclear moratorium in the United States, summed up the matter briefly as follows: I would point out that nuclear safety involves far more than just the reactors. Necessarily involved are the nuclear fuel reprocessing plants; nuclear waste storage and burial practices; radioactive transport practices; anti-sabotage measures; plutonium processing hazards; routine leakage of radioactive poisons all along the line; plutonium diversion prospects; and the preservation of national security. When the radioactive fission products and plutonium are shipped out of the power plants where they are produced, nuclear safety problems spread far and wide. Man cannot get rid of long-lived radioactivity once he has created it. He can move it around but it will always be somewhere. Some of it will have to be kept out of the environment for more than 100,000 years. Because humans are fallible, careless and sometimes demented (and he might have added, Mr. Speaker, venal, malicious and stupid) it is unreasonable to assume that we shall achieve a miraculous 99.99 per cent success in the radioactive containment operation, year in and year out. Furthermore it is reckless to count on some special immunity for nuclear facilities when it comes to earthquakes, sabotage or war. Because the literature handed out by the Canadian Nuclear Association and the public relations division of Ontario Hydro is prepared by persons skilled in public relations —which often means in deceiving people or in brainwashing the public — it is not surprising that the publication handed out in Pickering entitled "Nuclear Power and Our Environment in Canada" should give scarcely a hint of the immense dangers involved. Consider page 12 where we find: One Canadian scientist's reply to the question, "Is it safe to develop nuclear power?" was, "Safer than not developing it." He meant that if we do not use nuclear energy we will have to use other means to provide power and thus compound our pollution problem. Perhaps the PR men are not really dishonest; perhaps, in fact probably, they are just ignorant of the several other pollution-free methods of harnessing energy without depleting our unrenewable, polluting, fossil fuel resources. Because of their ignoring the alternative forms of energy, they are preparing the public to support politically the dangerous and irrational pohcies of the relatively few people who have now become the nuclear establishment. The PR men's job is to build prestige for the nuclear establishment. Report No. 3 of Task Force Hydro goes about this task with great vigour, especially in the name-dropping passages from pages 17 to 28. First of all it blithely assumes that nuclear power is the only alternative to fossil fuel, and having killed off all the good guys — that is by eliminating from its terms of reference the genuinely clean and perpetually renewable forms of energy power, namely, solar, wind, wood, geothermal sea-thermal, tidal and organic methane — it berates the present obvious air polluting disadvantages of fossil fuel power plants and touts, all-out, the nuclear power plant. In other words, it carries out a mock battle with the other bad guys — the fossil fuels — and ignores the existence of the really good guys whom I have listed. Task Force Hydro does take a brief look at the issue of radioactivity. Paragraph 5 reveals the absurdity of attempting to establish a so-called "safe level" of radiation. The International Commission on Radiological Protection has merely reached a consensus on a limit it is willing to recommend. The last sentence of the paragraph is an honest assessment — as far as it goes. And I quote: It should be noted, however, that since there is in effect no safe [in italics] threshold of radiation, there is an inherent difficulty in establishing protection standards. That's what it says. To be completely honest, the sentence should have added the words, "and still remaining in the nuclear reactor business." The propaganda sheet continues, "Is it safe?" and answers: Nuclear power reactors have been in operation in the United States and Britain since the 1950s and in Canada since 1962. There has not been one single, fatal accident in any of them. Now actually, an Idaho reactor exploded in 1961, killing three workers and discharging radioactivity into the atmosphere. Fortunately for others, the reactor was in an unpopulated part of the state. On Dec. 13, 1950, the Chalk River plant had an accident with an explosion, killing one and injuring five others. Only a small amount of material was involved in the explosion. According to reports, and I quote: "Only through good luck, 45,000 lb of the same material in an adjacent room did not detonate." 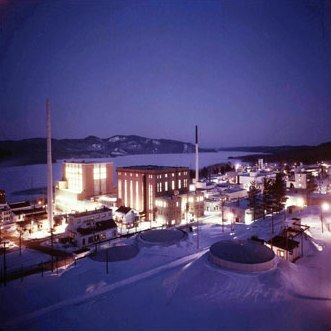 On Dec. 12, 1952, the NRX reactor at Chalk River suffered a "power surge" accident. Very high radiation was involved for workers — between 20 and 100 roentgens an hour. An engineering magazine said at the time: If 100 people were to receive a total body radiation of 400 roentgens, at least 50 would definitely have received a lethal dose. For this reason the normal health tolerance is limited to 300 milliroentgens per week per employee. However, had we attempted to apply this standard when working on this accident, we would have very quickly run out of manpower. One wonders about the health status of these workers now, 21 years later. On May 23, 1958, an NRU reactor at Chalk River suffered what was called a "power burst" as a result of a fuel rod failure. Very wide contamination occurred inside the plant. It took 600 men, including men from the armed forces, over two months to clean it up. Mr. G. C. Laurence, former member of the Atomic Energy Control Board, said it was very fortunate that no one was hurt or suffered an overdose of radiation in that accident. I quote: The material damage, however, was an impressive reminder of the latent energy and of the radioactive substances that could be released by accident. I was chairman of a small committee that inquired into the causes of that accident and it made me very dissatisfied with the reactor safety philosophy that prevailed then. On May 3, 1973, the Wall Street Journal referred to a recent accident at the Virginia Electric Power Co. atomic plant in which two men were killed. This "recent" accident may be the same one that took place at the Surrey Plant in Virginia in July, 1972. On that occasion, two workmen were inspecting sets of malfunctioning valves when yet another valve exploded and killed them. So the statement, Mr. Speaker, that there has not been a single fatal accident at nuclear power reactors in the United States, Britain or Canada is simply not true. This propaganda, which I picked up at Information Canada last week, should be withdrawn. It deceives the public, as of course it is intended to do. As long as the public thinks that nuclear power is safe and clean, the public will accept it. When the public realizes that it has been deceived, that may be another story. This government must come clean with the public. In 1998, the government approved the establishment of an emergency radio service to broadcast an alarm in the event of a major disaster at Chalk River (see the decision here). There is a timeline of Chalk River events here. 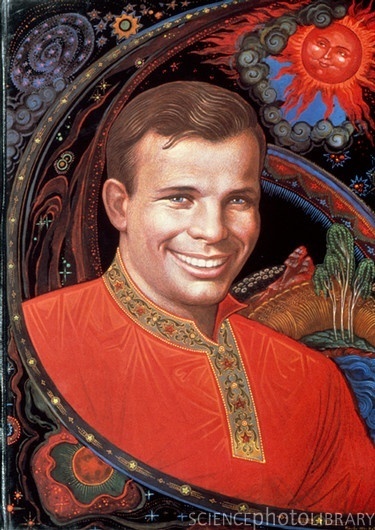 Soviet Cosmonaut Yuri Gagarin retro-futuristically recast in saint-like imagery through Russian iconographic painting. Image Source: Science Photo Library. Caption for the above image: Yuri Gagarin (1934-1968), Soviet cosmonaut. Gagarin became the first person in space when he was launched on Vostok 1 on 12th April 1961. The flight lasted for just one orbit, ending 108 minutes after take-off. This portrait is part of the icon painting tradition of Palekh, Russia. Miniature painted on lacquer, 1981. This symbolic sensibility around human spaceflight, which reminds us so deeply of our oldest myths, may explain why so many urban legends and conspiracy theories have arisen around the early history of space programs. Gagarin's case is no different. There is a piece debunking the conspiracy theories around this event at The Space Review. This heavenly discourse might also explain why Gagarin was falsely credited with saying that he had not seen god in space. It was in fact Khrushchev who said, "Gagarin flew into space, but didn't see any god there." We have to ask - why did divinity come up at all? Gagarin flew the Vostok 1 spacecraft 302 kilometres (188 miles) above Earth for total flight time of 1 hour and 48 minutes. 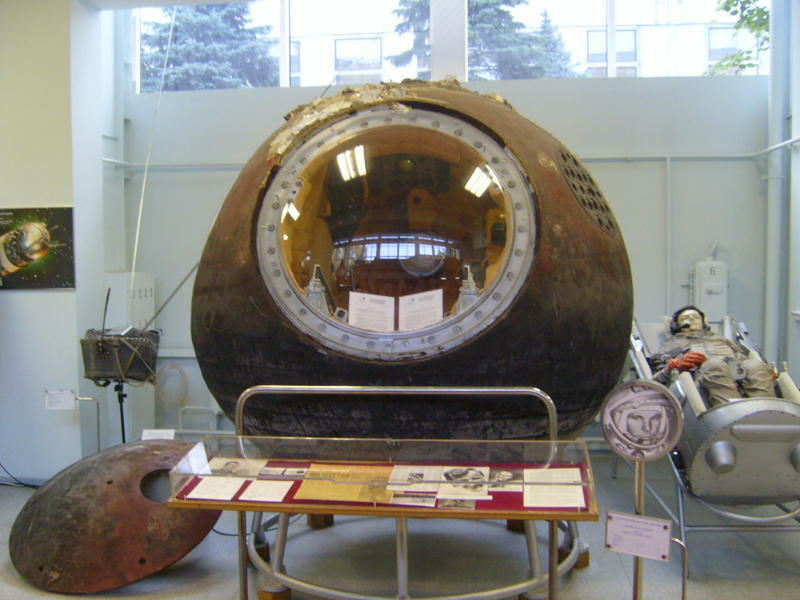 According to the Praxis Manned Spaceflight Log (p. 59), Gagarin ejected as planned during re-entry and "reportedly landed close to bemused farm workers and a cow, 26 km (16 miles) southwest of Engels, near Smelovako, Saratov." Wiki: "A farmer and her daughter observed the strange scene of a figure in a bright orange suit with a large white helmet landing near them by parachute. Gagarin later recalled, 'When they saw me in my space suit and the parachute dragging alongside as I walked, they started to back away in fear. I told them, don't be afraid, I am a Soviet like you, who has descended from space and I must find a telephone to call Moscow!'" Vostok I capsule used by Yuri Gagarin in first space flight. Now on display at the RKK Energiya Museum outside of Moscow. Image Source: Wiki. This post is not about a nuclear leak, rather a radioactive materials accident that took place in 1987. 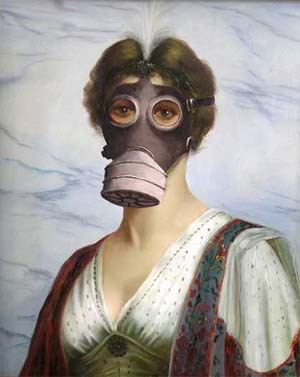 The blog The Last Word On Nothing recently summarized a famous incident in Goiânia, Brazil in which the locals were exposed to cesium chloride. It is considered one of the worst radioactive disasters ever and occurred after radiotherapy materials were scavenged from an abandoned hospital site. According to Wiki, "The dispersal of radiation was equivalent to a medium-size dirty bomb." 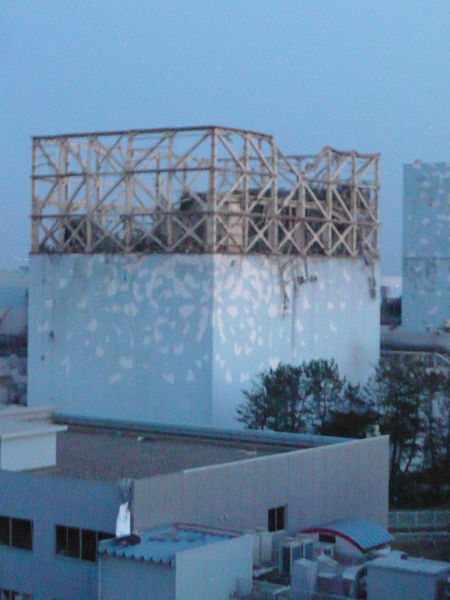 Damaged Fukushima Nuclear Plant #1 (13 March 2011). Image Source: Reuters via ABC. A woman trapped in a secure building in downtown Sendai made a tearful plea to the world for help. Somehow, we can hang in there, I hope. We don't have any electric, water, gas... but please, help the people who lost their homes and the people on top of the buildings asking for help," Yasue Schumaker told CNN. "We need foreign countries' help," she said, choking back tears. "We're in an emergency, please help us." Here is a summary of the disaster during its first month, from 11 March to 10 April. It shows how government, business and the media will struggle and fail to get a grasp on a rapidly changing nuclear disaster.